NEW YORK, Oct. 15, 2018 /PRNewswire/ -- Arria NLG, the leading provider of Artificial Intelligence-based Natural Language Generation ("NLG") solutions, is pleased to announce the release of Studio for BI 2.0 ("Studio") — the second release of its ground-breaking NLG add-in for Business Intelligence ("BI") platforms. The release of Studio coincides with Microsoft's Power Summit which is currently running at the Phoenix Convention Center (October 15-18, 2018). Studio for BI 2.0 is a major AI milestone as it enables the everyday use of Natural Language Generation in business via BI dashboards. It empowers BI dashboard users to easily add plain English summaries, explanations, reports and stories ("narratives") to their entire dashboard. 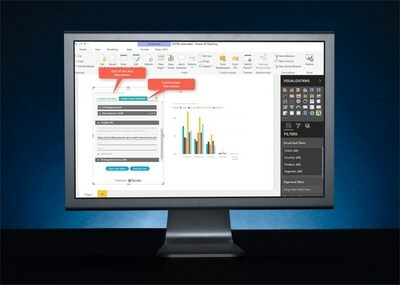 As a sponsor of the Summit, Arria is showcasing the ability of Studio for BI 2.0 to easily add layered narrative sophistication to existing BI dashboards - including Microsoft's own Power BI which has over 5 million users. "Studio for BI 2.0 is a major AI milestone as it enables the everyday use of Natural Language Generation in business via BI dashboards. It empowers BI dashboard users to easily add plain English summaries, explanations, reports and stories ("narratives") to their entire dashboard. These narratives are written in plain English, as if by a human expert, and are automatically generated based on insights Studio extracts from the dashboard's underlying datasets." —Sharon Daniels, Arria NLG, CEO. Out-of-the-Box Narratives: Enables BI dashboard users to select the data they want to describe, choose the type of analysis they want narrated (e.g. Variance, Statistics, Time-Series, etc. ), choose how much information they want to display, then instantly generate expert plain English narratives filled with insights. No programming knowledge is required as Arria's Insight APIs do all of the heavy lifting. Extended Narratives: Enables users to customize Arria's Out-of-the-Box Narratives with their own domain-specific language. This allows sophisticated users such as business analysts to have full control of their narratives. Programmable Narratives: Enables users with some programming knowledge to use Studio's fully programmable interface to create narratives at any level of sophistication (from summaries to full reports and stories) and to add them to their BI dashboards as they choose. As part of the breakthrough technologies powering Studio for BI 2.0, Arria developed insight detection algorithms referred to as Insight APIs™. These insights provide the basis for Studio to be used to easily extend narratives for progressively more sophisticated use cases. Arria currently offers five Insight APIs: (1) Variance, (2) Statistics, (3) Distribution, (4) Time-Series, and (5) Correlation. The narratives generated from Arria's Insight APIs allow BI dashboard users to instantly read and understand - directly in the context of their own dashboards - the key insights that are typically hidden within their datasets and visualisations. ARRIA NLG is the leading innovator in the field of natural language generation (NLG), a form of artificial intelligence software. NLG specializes in extracting insights from complex data sources and communicating information in natural language (i.e. as if written or spoken by a human). Arria's technology is adding value wherever on-demand narratives or reports are required, be it financial analysis and reporting, business intelligence dashboards, or alongside other cognitive technologies such as conversation agents and virtual assistants. Arria's game-changing product is NLG Studio. NLG Studio brings the best of the company's advanced technology into a self-service tool available in the cloud or on-premise. With NLG Studio's ease of use, business users and developers alike can build and deploy their own NLG systems, accessing the proven rules-based linguistic capabilities and software architecture that Arria uses to build advanced NLG solutions for its global clients. While Arria offers professional services directly, it also nurtures a comprehensive partner program trained in delivering NLG solutions using Arria's technology. Arria's mission is to make NLG accessible to everyone to support its NLG Everywhere vision. Arria has global offices in EMEA, USA, Canada, and Asia-Pacific. For additional information, visit https://www.arria.com/.